Persecution of witches can be dated back to at least the 10th century, and continued throughout the medieval period until well after the Protestant Reformation of the 1500s. 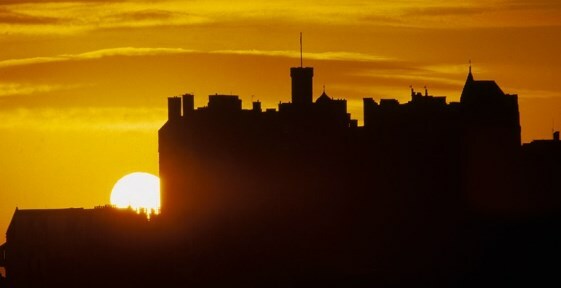 Edinburgh Castle was a key location for the witch-hunts at the end of that century. The Scottish Witchcraft Act had been introduced in 1563, during the reign of Mary Queen of Scots. But it was her son, King James VI, who enforced it with enthusiasm. The most notorious persecutions, personally overseen by James, were the North Berwick witch trials of 1590–2. This episode was sparked by James’s belief that he had been threatened by a witch in North Berwick. In 1590, he was returning to Scotland from Denmark with his new bride, Anna, daughter of the Danish king. Their ship was battered by a storm, which James believed had been conjured up by witchcraft in an attempt to kill him. Over two years, well over 100 women and men were brought from North Berwick to Edinburgh Castle and brutally tortured. They usually confessed to consorting with the Devil, and many were duly hanged or burned on the open ground now occupied by the Esplanade. The Witches’ Well was installed on the Esplanade in 1894 as a modest memorial to those who suffered and died here. James’s belief in witchcraft was so strong that he wrote his own treatise on the subject. Daemonologie was published in Edinburgh in 1597, and is largely intended to encourage belief in ‘these detestable slaves of the Devil’ and to lend support to witch-hunts. When James became king of England in 1603, the country’s leading playwright began work on a Scottish play for his new monarch. It is generally thought that Shakespeare included the witches in Macbeth specifically to appeal to James. Very sadly, the persecution of supposed witches has not been consigned to history. News stories appear almost daily in the media, describing beatings, abandonment and even murder of children for ‘witchcraft’ in certain African countries. A chilling thought as our own children enjoy the fun and games of Hallowe’en. The Witches Well is sometimes overlooked when visiting the castle, be sure to have a look at it next time you’re visiting us!